A wide range of critical theorists is used in the study of international politics, and until now there has been no text that gives concise and accessible introductions to these figures. Critical Theorists and International Relations provides a wide-ranging introduction to thirty-two important theorists whose work has been influential in thinking about global politics. Each chapter is written by an expert with a detailed knowledge of the theorist concerned, representing a range of approaches under the rubric ‘critical’, including Marxism and post-Marxism, the Frankfurt School, hermeneutics, phenomenology, postcolonialism, feminism, queer theory, poststructuralism, pragmatism, scientific realism, deconstruction and psychoanalysis. 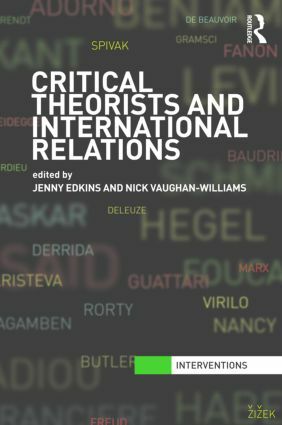 Written in engaging and accessible prose, Critical Theorists and International Relations is a unique and invaluable resource for undergraduates, postgraduates and scholars of international relations.